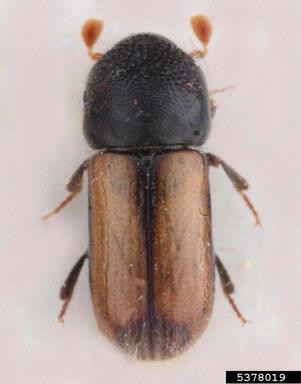 The European hardwood ambrosia beetle (Trypodendron domesticum) attacks a broad range of hardwood trees. It is widely distributed in Europe and western Asia. It has been intercepted numerous times in North America, and has recently established populations in Canada. Surveys are conducted because of the presence of potential host material in Wyoming and this pest is attracted to the same lure as other targeted bark beetles. To date, it has not been found in Wyoming. One hundred thirty-two traps have been placed throughout twenty-two counties in Wyoming since 2008. The European hardwood ambrosia beetle survey is conducted by the Animal and Plant Health Inspection Service, Plant Protection and Quarantine. A Lindgren funnel trap with host attractant is placed on or near the host plant from May until September. If suspects are found they are sent to a regional entomologist for further identification.